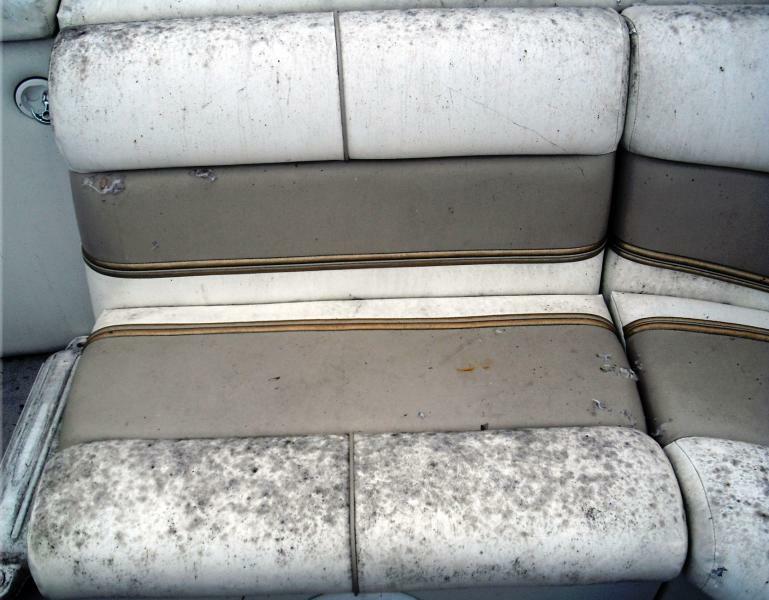 Mildew is one of the most common problems with vinyl boat seats. It often grows on seats when boats are covered because it thrives in warm, dark, damp places. Mildew ends up smelling and looking bad, and it can eventually break down the vinyl your seats are made of. It’s best to take measures to prevent it whenever possible and clean it up quickly once you realize it’s become a problem. After an outing, try to let your boat dry out before you cover it. It is a good idea to let it sit with the storage compartments open to dry well before covering for extended periods of time. When you do cover it, be sure to stick in a moisture absorbing, mildew prevention substance. You can buy buckets of commercially produced mildew prevention solution or you can try one of many popular household products. A tin or two of charcoal bricks (not match light!) works very well. If mold is allowed to grow it will also penetrate the vinyl and over time it will not be able to be removed, the only thing left to do is to re-dye or replace. You should use a mold and mildew killer and cleaner to stop mildew in its tracks and prevent it from continuing to grow. You can buy these at any gardening store and most marine suppliers.